Still have an issue? 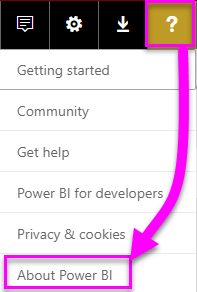 Visit the Power BI support page. Microsoft Power BI Embedded (PBIE) allows application developers to embed stunning, fully interactive reports, into applications without the time and expense of building their own data visualizations and controls from the ground-up. Who is the target audience for Power BI Embedded? Developers and software companies making their applications referred to as independent software vendors (ISVs). How is Power BI Embedded different from Power BI the service? Power BI Embedded is intended for ISVs or developers who are building applications and want to embed visuals into those applications to help their customers make decisions without building an analytics’ solution from the ground up. Embedded analytics enables business users to access the business data and perform queries to generate insights using this data within the application. Power BI is a software-as-a-service analytics solution that gives organizations a single view of their most critical business data. What is the difference between Power BI Premium and Power BI Embedded? Power BI Premium is capacity geared toward enterprises, who want a complete BI solution that provides a single view of its organization, partners, customers, and suppliers. Power BI Premium helps your organization make decisions. Power BI Premium is a SaaS product and comes with the ability for users to consume content through the Power BI portal, mobile app, and through internally developed apps. Power BI Embedded is for ISVs or developers who are building applications and want to embed visuals into those applications. Power BI Embedded helps your customers make decisions because Power BI Embedded is for application developers, customers of that application can consume content stored on Power BI Embedded capacity, including anyone inside or outside the organization. Power BI Embedded capacity content can't be shared through one-click publish to Web or one-click publish to SharePoint, and it doesn't support SSRS reports. What is the Microsoft recommendation for when a customer should buy Power BI Premium vs. Power BI Embedded? Microsoft recommends that enterprises buy Power BI Premium, an enterprise-grade, self-service cloud BI solution, and ISVs buy Power BI Embedded, cloud-powered embedded analytics components. However, there are no restrictions on which product a customer can buy. There may be some cases where an ISV (typically large) wants to use a P SKU to get the additional benefits of the pre-packaged Power BI service within their organization as well as embed in their applications. Some enterprises may decide to use A SKUs in Azure if they're only interested in building line-of-business applications and embedding analytics into them and aren't interested in using the pre-packaged Power BI service. Embed tokens with PRO license are intended for development testing, so the number of embed tokens a Power BI master account or service principal can generate is limited. Purchase a capacity for embedding in a production environment. There's no limit to how many embed tokens you can generate when a capacity is purchased. Go to Available Features to check the usage value that indicates the current embedded usage in percentage. What is the difference between the A SKUs in Azure and the EM SKUs in Office 365? Power BI Embedded is a set of APIs available for developers to create an embedded analytics solution in a Platform as a Service offering. For the Embedded analytics scenario, PowerBI.com helps ISVs and developers manage their embedded analytics solution content and tenant level settings. Here is a partial list of differences you may use with each. Power BI now offers three SKUs for embedding: A SKUs, EM SKUs, and P SKUs. Which one should I purchase for my scenario? What are the prerequisites to create a PBIE capacity in Azure? Sign in to your organizational directory (MSA accounts are not supported). You need to have a Power BI tenant, that is, at least one user in your directory has signed up to Power BI. You need to have an Azure subscription in your organizational directory. How can I monitor Power BI Embedded capacity consumption? Using the Power BI Admin portal. Downloading the metric app in Power BI. Can my capacity scale automatically to adjust to the consumption of my app? While there is no automatic scaling now, all the APIs are available to scale at any time. Why creating/scaling/resuming a capacity results in putting the capacity into a suspended state? The provisioning of a capacity (scale/resume/create) may fail. The caller of the provisioning call should check the ProvisioningState of a capacity using Get Details API: Capacities - Get Details. Can I only create Power BI Embedded capacities in a specific region? How can I find what is my PBI tenant region? You can use the PBI portal to understand what is your PBI Tenant region. What is supported by the Cloud Solution Provider (CSP) channel? Why do I get an unsupported account message? Power BI requires you to sign up with an organizational account. Trying to sign up for Power BI using an MSA (Microsoft account) isn't supported. Can I use APIs to create & manage Azure capacities? Yes, there are Powershell cmdlets and Azure Resource Manager APIs you can use to create & manage PBIE resources. What is the PBI Embedded dedicated capacity role in a PBI Embedded solution? To promote your solution to production, you need the Power BI content (app workspace) that you are using in your application to be assigned to a Power BI Embedded (A SKU) capacity. What are the Azure regions PBI Embedded is available? What is the authentication model for Power BI Embedded? Power BI Embedded continues to use Azure AD for authentication of the master user (a designated Power BI Pro licensed user), or with service principal for authenticating the application inside Power BI. The authentication and authorization of application users implemented by the ISV, the ISV can implement their authentication for their applications. If you already have an Azure AD tenant, you can use your existing directory, or you can create a new Azure AD tenant for your embedded application content security. To get an AAD token, you can use one of the Azure Active Directory Authentication Libraries. There are client libraries available for multiple platforms. My Application already uses AAD for User Authentication. How can we use this Identity when authenticating to Power BI in a "User Owns Data" scenario? What object ID is the service principal object ID? The Object ID from the main screen of a registered app is the object ID for the app. The object ID found in the Managed application in local directory > Properties section is the service principal object ID you need to use. This object ID is to reference a service principal for operations or to make changes to the service principal object ID. Such as applying a service principal as an admin to a workspace. How is Power BI Embedded different from other Azure services? Use PowerBI.com to assign/un-assign workspaces to your Power BI Embedded capacity. What deploy regions are supported? Australia Southeast, Brazil South, Canada Central, East US 2, India West, Japan East, North Central US, North Europe, South Central US, Southeast Asia, UK South, West Europe, West US, and West US 2. What type of content pack data can be embedded? Dashboards and tiles that are built from content pack datasets cannot be embedded, however, reports built from a content pack dataset can be embedded. For RLS, the ISV developer controls the data filtering as part of the model creation and embed token generation. The end user sees only what the ISV allows the user to see. In this case, the user can choose to see less than what's being filtered, but won’t be able to bypass the RLS configuration and see more than what's allowed. How do I manage permissions for service principals with Power BI? Once you enable service principal to be used with Power BI, the application's AD permissions don't take effect anymore. The application's permissions are then managed through the Power BI admin portal. This situation matters when you add the service principal as an admin to the new workspace. You can manage this task through the APIs or with the Power BI service. When to use an application ID vs. a service principal object ID? The application ID is used to create the access token when passing the application ID for authentication. To reference a service principal for operations or to make changes you use the service principal object ID — for example, applying a service principal as an admin to a workspace. Can you manage an On-premises data gateway with service principal? You can't manage an On-premises data gateway (data gateway) using service principal like you can with a master account. With a master account, you can install a data gateway, add users to the gateway, connect to data sources, and do other administrative tasks. With service principal, you can configure row-level security (RLS) using an SQL Server Analysis Services (SSAS) on-premises live connection data source. This way you can manage users and their access to data in SSAS when integrating with Power BI Embedded using a service principal. Can you sign into the Power BI service with service principal? No - you can't sign into Power BI using service principal. Also, you can’t consume content as a user in external applications (SaaS embed), only when you generate an embed token. What are the best practices to improve performance? How do I purchase Power BI Embedded? Power BI Embedded is available through Azure. What happens if I already purchased Power BI Premium and now I want some of the benefits of Power BI Embedded in Azure? Customers continue to pay for any existing Power BI Premium purchases until the end of their current agreement term and then may switch their Power BI Premium purchases as necessary at that point. No, Power BI Embedded includes the Azure-based capacity that you need to deploy and distribute your solution to customers. Power BI Embedded bills on a predictable hourly rate based on the type of node(s) deployed. As long as your resource is active, you are billed even if there is no usage. To stop being billed, you need to pause your resource actively. Who needs a Power BI Pro license for Power BI Embedded and why? Any developer that requires the use of the REST APIs needs a Power BI Pro license or service principal. Any analyst that needs to add reports to a Power BI workspace can either have a Power BI Pro license or use service principal. Any tenant admin that needs to manage the Power BI tenant and capacity is required to have a Power BI Pro license. Because Power BI Embedded allows the use of the Power BI portal for managing and validating embedded content, the Power BI Pro license is required to authenticate the App inside PowerBI.com to get access to the reports in the right repositories. However, for creating/editing embedded reports inside your application, the end user does not need a Pro license as the user isn't required to be a Power BI user at all. Since Power BI Embedded is a part of Azure, it is possible to use the service with the $200 credit received when signing up for Azure. Is Power BI Embedded available for national clouds (US Government, Germany, China)? Power BI Embedded is also available for the national clouds. Is Power BI Embedded available for non-profits and educational? Non-profit and educational entities can purchase Azure. There is no special pricing for these types of customers in Azure. What is Power BI Workspace Collection? Power BI Workspace Collection (Power BI Embedded Version 1) is a solution that is based on the Power BI Workspace Collection Azure resource. This solution allows you to create Power BI Embedded applications for your customers using Power BI content under the Power BI Workspace Collection solution, dedicated APIs, and workspace collection keys to authenticate the application to Power BI. Can I migrate from Power BI Workspace Collection to Power BI Embedded? You can use the migration tool to clone Power BI Workspace Collection content to Power BI - https://docs.microsoft.com/power-bi/developer/migrate-from-powerbi-embedded#content-migration. Start with the Power BI Embedded application POC that uses Power BI content. Once you are ready for production, purchase a Power BI Embedded dedicated capacity and assign your Power BI content (workspace) to that capacity. You can continue to use Power BI Workspace Collection while building in parallel with a Power BI Embedded solution. Once you are ready, you can move your customer to the new Power BI Embedded solution and retire the Power BI Workspace Collection solution. Is Power BI Workspace Collection on a path to be deprecated? Yes, but customers that are already using the Power BI Workspace Collection solution can continue to use it until it is deprecated. Customers can also create new workspace collections and any Power BI Embedded applications that still use the Power BI Workspace Collection solution. However, this also means that new features aren't added to any Power BI Workspace Collection solutions and that customers are encouraged to plan their migration to the new Power BI Embedded solution. When is Power BI Workspace Collection support discontinued? Customers that are already using the Power BI Workspace Collections solution can continue to use it until the end of June 2018 or until the end of their support agreement. In what regions can PBI Workspace Collection be created? The available regions are Australia Southeast, Brazil South, Canada Central, East US 2, Japan East, North Central US, North Europe, South Central US, Southeast Asia, UK South, West Europe, West India, and West US. Why should I migrate from PBI Workspace Collection to Power BI Embedded? Some new features and capabilities are introduced in the Power BI Embedded solution that you can't do with Power BI Workspace Collection. All the PBI data sources are supported as opposed to the two data sources that are with Power BI Workspace Collection). New features such as Q&A, refresh, bookmarks, embedding dashboards & tiles, and custom menus are only supported in the Power BI Embedded solution. What is the Embedding setup tool? The Embedding setup tool allows you to quickly get started and download a sample application to begin embedding with Power BI. I've downloaded the sample app, which solution do I choose? If you're working with the Embed for your customers experience, save and unzip the PowerBI-Developer-Samples.zip file. Then open the PowerBI-Developer-Samples-master\App Owns Data folder and run the PowerBIEmbedded_AppOwnsData.sln file. If you're working with the Embed for your organization experience, save and unzip the PowerBI-Developer-Samples.zip file. Then open the PowerBI-Developer-Samples-master\User Owns Data\integrate-report-web-app folder and run the pbi-saas-embed-report.sln file. How can I edit my registered application? To learn how to edit Azure AD-registered applications, see Quickstart: Update an application in Azure Active Directory. How can I edit my Power BI user profile or data? You can learn how to edit your Power BI data here. For more information, see Troubleshooting your embedded application.